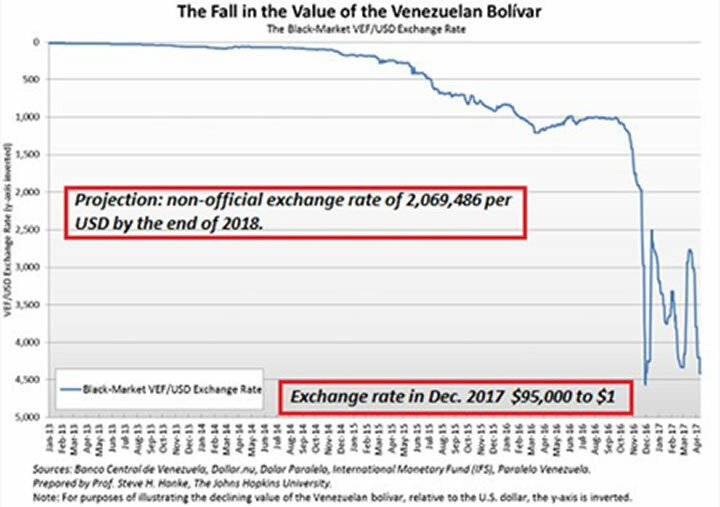 David Smith: Two years ago, in this space, I penned an essay discussing how Americans - and other countries that are "dollarized" - where the local currency is either the USD or pegged to it - had a significant advantage when it came to getting the most for their money when exchanging dollars for precious metals. The Canadian Dollar is known in the trade as a "Cando". In 2008 it traded at US$1.10, which meant that at the time, Canadians could buy 10% more metal than Americans. 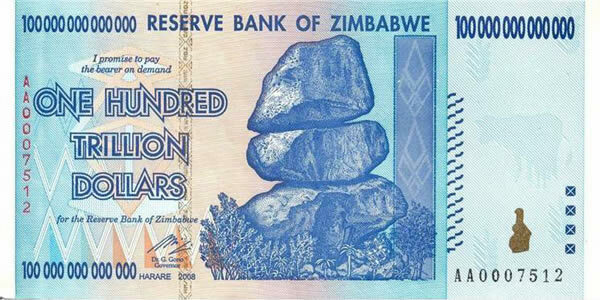 In 2012, it had a high of US$1.01. In 2016, it bottomed at US$0.58 (ouch! ), and today still trades at about 80 cents on the dollar. As the chart shows, Canadians get about 20% less gold and silver for their money than their southern neighbors (us). Zim and Ven, racing for the bottom. Then there's the perennial currency basket case Zimbabwe - now entering its second hyperinflationary blowout in just the last couple of decades. 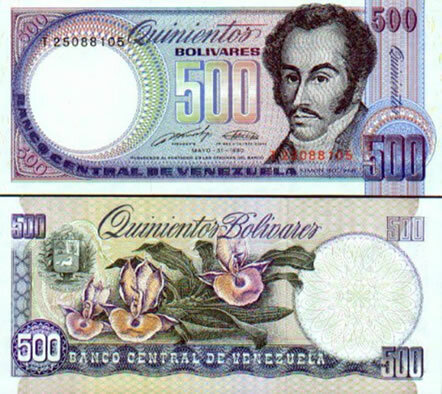 Zim is currently playing touch and go with Venezuela to see if the latter's "bolivar fuerte" (strong bolivar), transacted by the pound on a produce scale rather than from a wallet, will incinerate itself first. Zim's previous "Paper Promise"- Angling for a rematch? 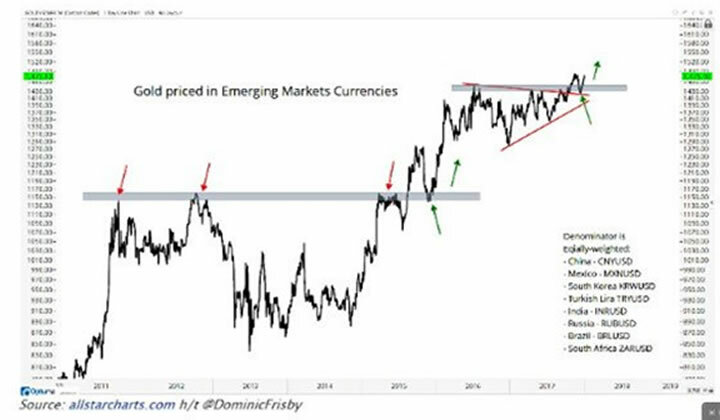 Buyers in Emerging Markets, in which gold prices are making new highs relative to their own fiat paper, are also paying more for their stash. Nevertheless, demand there is rising as well - which as previously noted - is an important "tell" regarding the health and durability of the ongoing bull market. This is because even when facing a less advantageous exchange rate, emerging market gold customers are still solidly on the buy. Additional evidence indicates that we are just now entering the second year of what could become a lengthier - and considerably more powerful than-expected upside run. We say this in part because of some serious work done by Bob Hoye's Institutional Advisors along with the Technical observations of Ross Clark They note that for the last 50 years, important lows for gold have taken place on a regular basis, stating, "The most recent (low) was in December 2016, one year after a premature low at 7.2 years in December 2015." After an initial surge off the cycle lows, the price tends to move methodically higher for the first two years. During that period, we have found that a lower 20-week moving average envelope provides support. This was most recently tested in December 2017... Except for 2002, a trailing one-week stop after the 55th week, kept participants in the market until the first week after the top. You might want to commit that last part to memory. If the 8-year cycle pattern continues to play itself out, not only could this nascent gold bull have a long ways to run in terms of time and price, but an attentive investor could use the kind of trailing stop-loss discussed, in order to stay with the trend as long as possible, holding onto significant gains before offsetting all or most of their holdings for a good profit. The U.S. dollar has been "king of the hill" since its establishment as a backstop for the so-called petrodollar, in an agreement with Saudi Arabia and other oil producing countries as a result of the 1970's oil spike. That idea was to create a stable and reliable revenue stream for oil exporters. The price of oil was thus set in dollars, in the process establishing the unit of account as the world's reserve currency. Even so, the petrodollar's purchasing power is, to some extent, predicated upon the rate of inflation and the value of the dollar on the FOREX. Profligate creation of dollars by the Federal Reserve, many of which have "migrated" offshore, driving down the recipients' purchasing power. Massive debt growth at all levels of the U.S. body politic - leading inevitably to more dollar creation in an attempt to pay the bill. Unnaturally low interest rates since the 2008 melt-down, obscuring the "signals" given by rates that indicate if a given investment makes "dollars and sense", leading to soaring mal-investment and speculation. A changing geopolitical landscape, wherein the BRIC countries - Brazil, Russia, India and China (plus others) - have tired of the constraints placed upon them by restrictive U.S. policies. The launch and coming build-out of The New Silk Road from Asia to Europe and the Middle East, encompassing 40 per cent of the world's population in an economic-financial-political paradigm less-incumbent on the West's wishes. Lessening dependence on the US dollar as the world's reserve currency in favor of loans and payments denominated in Chinese yuan, Russian rubles, commodities...and gold. All these factors and more, mean that right now and continuing during the coming years, the U.S. dollar is going to be buying less of just about everything, and that includes precious metals. The key elements of this sea-change as they relate to you? Lower U.S. dollar-denominated gold and silver purchasing power. Increased global demand for these metals, especially in the many countries seeing their local currencies strengthen vis a vis the dollar. Depleting gold reserves due to a lack of big discoveries. Lower head-grades across the board. Increased cost of production due to environmental and "country risk". Note established 50-day MA (blue line) "Golden Cross"
While just about everything in life is based upon probabilities, the odds right now strongly favor that the next leg of the secular bull run in the metals is underway. Four years of a cyclical bear market 45-50% retracement (2011-15); an 8-month initial bull counter-trend rally (most of 2016); and finally, 18 months of retracement and consolidation (mid-2016 to December 2017) have already taken place. Taken together, this alignment of factors makes a compelling argument for completing your metals' acquisition plan in a timely manner. And if you still have yet to get started... what's your excuse? David Smith is Senior Analyst for TheMorganReport.com and a regular contributor to MoneyMetals.com. For the past 15 years, he has investigated precious metals’ mines and exploration sites in Argentina, Chile, Mexico, Bolivia, China, Canada, and the U.S. He shares his resource sector findings with readers, the media, and North American investment conference attendees.